After the Highway 61 road trip in October 2013 I didn’t go anywhere in the Autumn/Fall of 2104, I’m not sure why now – maybe lack of money…! Anyway, I remember thinking in early 2015 about what a great time I’d had and started to investigate what other American road trips there were that I could undertake. My tentative plan was to go later that year in October again when the American football season is on… but also it’s not ‘high season’ for tourists plus the weather is more pleasant in most places: warm but not too hot, generally dry before the rainy season, that sort of thing. So in researching around I came across the Pacific Coast Highway and started to pull a plan together. It became apparent that almost everyone who’s posted something online about doing the trip recommends travelling south so that you’re on the ‘right’ side of the road, pun intended, in other words the ocean side. 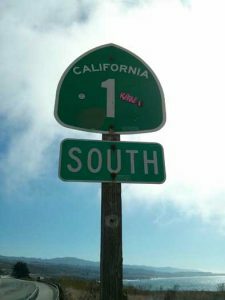 The California Legislature has officially designated just a section of California State Route 1 (the highway’s official route name) near LA as the ‘Pacific Coast Highway’, along with other sections as other ‘Highway’ names. However, official bureaucracy aside, the general consensus seems to be that the PCH has its northern terminus at US Highway 101 near Leggett in Mendocino County and the southern terminus is at Interstate 5 near Dana Point in Orange County, south of LA. I did consider starting at ‘true’ north but decided the save that for another trip – I have this idea one day of doing the whole of the Pacific Coast from Seattle down to San Diego, which would be a mega trip, and I could cover from Leggett to my eventual starting point then. 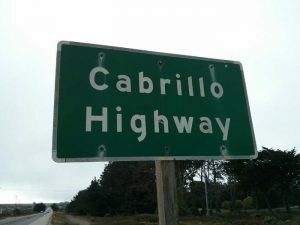 Highway 1 has several portions designated as either Pacific Coast Highway (PCH), Cabrillo Highway, Shoreline Highway, or Coast Highway. This sign is just north of Pigeon Point Lighthouse, looking south. I chose to start at Pacifica, just south of San Francisco. In part this was because it’s just a few miles across the San Francisco Peninsula from SFO airport so it would be nice and easy when arriving. Plus, Leggett is 160 miles north of SF so to ‘start’ the PCH there I’d (probably) drive north up Hwy 101 (to avoid the PCH and for speed) and then come back down Hwy 1 on the coast. This seemed a bit of waste of time and effort – and maybe it was the wrong call – but as I said I do plan on doing that northernmost section at some point in the future. I also opted to fly in and out of SFO rather than coming back from LA. In doing this I would avoid a hefty one-way drop-off hire car fee but also the second part of the trip after getting to the end of the PCH at Dana Point was to quickly blast back north and spend some time in Wine Country north of SF – and then finish off with a visit to Levi’s Stadium to watch the 49ers.